While riding my bike alone in Deer Valley on Flagstaff Mountain the other night, I bounced out of the woods too quickly and nearly flew off the trail into a rough meadow. I spun along in low gear, looking to get back on the trail when I noticed a set of equipment for the new chair lift. I rode towards the shadows, directly into the glaring solstice sun, with a western breeze in my face. It was tough going in the grass so I rode with my head down, concentrating on my front wheel. I did look up occasionally as I approached the equipment and I noticed, hundreds of chairs, a lift house, some towers and a huge BULL MOOSE not 20 yards away. I circled back quickly, muttering friendly words of encouragement, to a safe distance of about 50 yards, just behind a stack of lift chairs. 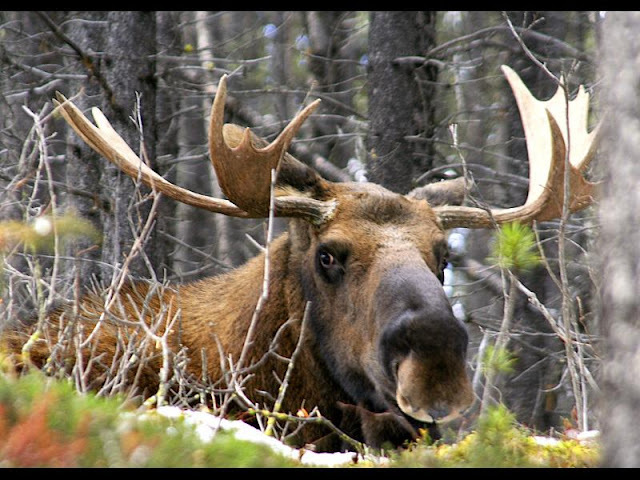 We eyed each other cautiously for a while and he bugled and burped until a cow moose strolled out of the Aspens. I thought that I may be in trouble for interrupting a lovers tryst until yearling calf walked out of the woods. The cow put her head down to show her displeasure with me and I thought I was a dead man. Just then another twin calf (they all look the same) walked out of the woods and I began seriously looking for an escape. I could ride away quickly but I knew I would never get into my toe clips or I would crash and burn. I could run into the woods and try to keep a tree between me and the moose but there were 4 of them and they could easily outflank me. My best option, I figured, would be to jump into the middle of all the chairs and hope they weren’t very nimble. I watched them, three tons of unpredictable ungulate, with my heart in my throat. I was fascinated with the huge rack, the long legs, the shear bulk and the little goatees. They had a menacing wildness as well as gentleness and grace. The mother nibbled and licked the ears of one of the calves, while the father grazed unconcerned, all the while gurgling imperceptibly to each other. The couple seemed focused on one primeval purpose yet seemed to know that the time and the place were not quite right. I stood there for 20 minutes (OK it was more like 5 minutes but I was very excited), respectfully watching them, with their apparent permission, and feeling like a privileged witness to a final family gathering. They eventually started showing concern with the sound of approaching heavy machinery, impending development and the eventual loss of their peaceful home. They startled and started, twitching nervous ears, until the cow abruptly dashed across the meadow into the opposite woods. The calves galloped awkwardly after her and the bull followed begrudgingly, looking at me as if I would understand. They crashed into the forest, breaking trees and causing a tremendous ruckus as they located each other again. They had blocked my escape route so I sat tight, shaking from the experience and waiting patiently for them to make the first move. Eventually, they came back out of the woods, walked across the meadow, up the adjacent hill and out of sight. They allowed me to escape and finish my ride, with my head up and eyes peeled at every dark shadow in the conifer forest, wondering if I would see them again - ever. The habitat these animals enjoy is to become the Flagstaff development with millions of units and endless ski lifts and runs. The Flagstaff development is a done deal, it is all over except for the crying. There will be other developments, and it doesn’t matter if they are in Deer Valley, the Kaiparowits plateau, or on the moon, they affect all of us intrinsically. Wally Stenger said we need just to know that wild places exist. While this philosophy may be appropriate for humans, it doesn’t work for wildlife. This moose family’s precious wild habitat is shrinking as quickly as our own. They will soon be gone - to find replacement habitat, as the EIS optimistically predicts, or more likely to crash through the windshield of some rental Range Rover. Gone with them will be a piece of our quality of life, our wilderness and our wildness. Where will we go when all of our wilderness is gone?